Welcome to Adamstown Eye Care, where every day we work to protect your eye health and explore the many new ways that your vision may be improved. Here, all of your eye care needs are conveniently located in one place. This friendly and comfortable environment is ready to meet all of your requests and provide you with the knowledgeable, attentive and precise care you are seeking. Browse the links above to learn about our office, our staff and our many services. Plan your next appointment, learn about new high quality eye wear and how it can improve your vision, discover the difference that personal attention makes in your care or contact us through this site for more direct assistance. Whatever interests you about your eyes and your vision, our office is uniquely qualified to meet your special needs. 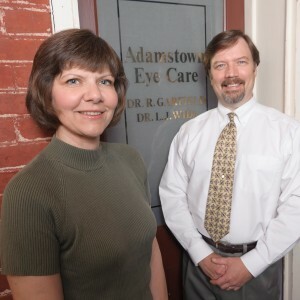 Adamstown Eye Care was established in 1994 to better serve northern Lancaster County and the surrounding region. Our founding doctors recognized that patients should expect more from their caregivers. This is a unique environment where the quality of your vision always comes first, without compromise. Assisting you with a knowledgeable and attentive staff is the foundation of that philosophy. With decades of proven and reliable experience, Adamstown Eye Care is recognized throughout the community as a leader in quality eye care. Providing an extra measure of attention to your special needs greatly enhances the care that you receive. Our precision skills and state-of-the-art instruments make certain that your results are accurate and beneficial. Adamstown Eye Care is readily available to offer a high level of care. Our convenient location, extended hours and wide range of services are all designed with the needs of our patients in mind. We are locally owned and thankful to have the opportunity to contribute to the well being of our community. If you would like to schedule an appointment click here or call us.